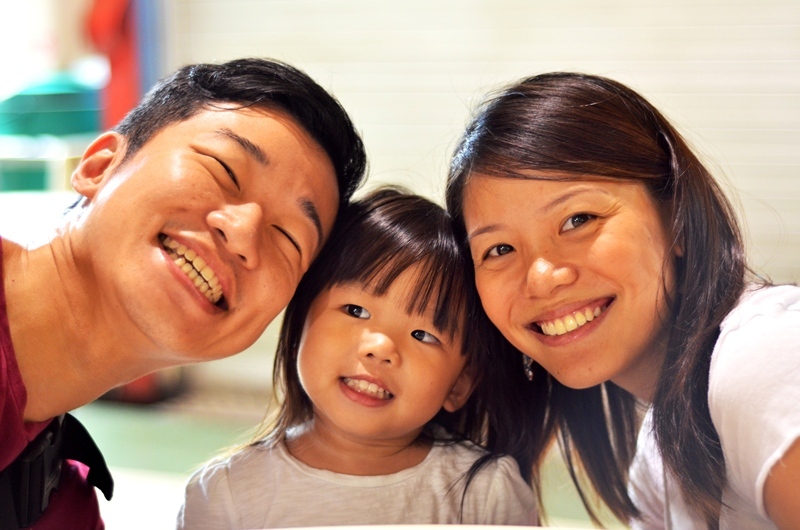 Excited about meeting Kenneth and Lindy for the first time in almost 4 years and of course her lovely 3 year-old daughter, Heidi, the early morning huge downpour did nothing to dampen my anticipation and ecstatic mood. Cliche it might sound, but I do believe in fate sometimes. Having known Kenneth as a bachelor back in my NS days, I witnessed his marriage with Lindy and now growth of his princess. It just reinforces my conviction on my belief in fate. Furthermore, is it not already something in itself that years down the road, we could just picked up from where we last met and reminisced the good old times? What Kenneth and Lindy made me understand more was 'family love' and I learnt that love indeed makes a family, for Heidi is certainly an essence and embodiment of their love. An outing consisting of 4 foodies surely did not disappoint. We started the day at a humble hideout located at Holland Drive Market and Food Centre. It must have been almost 15 years ago since I last tasted kway chap since the first and last time I tried, I was put off by the very strong appalling smell of the pig's offal. With an intended visit to the other kway chap stall (Blanco Court, which was unfortunately closed on Mondays), we settled for Cheng Heng Kwap Chap which was located just few stalls away. 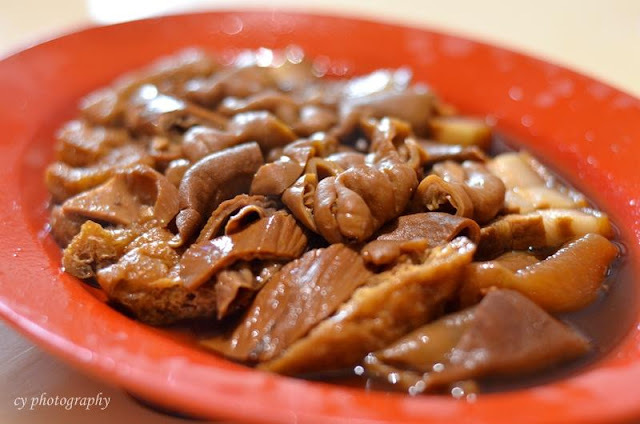 Kway Chap is a Teochew dish of flat, broad rice sheets (think of broad hor fun) in a soup usually made with dark soy sauce and other condiments and typically served with braised duck meat, pig offal, preserved salted vegetables and not forgetting the braised hard-boiled eggs of course! (+) The braised soy sauce was fragrant and complemented the rice sheets well. (+) Duck meat was tender and soft. 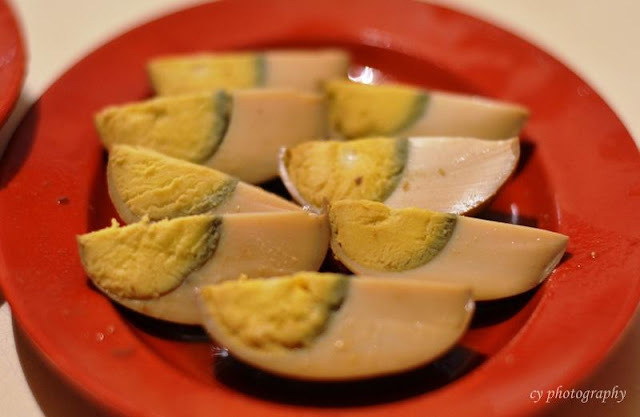 (+) When consumed with the skin with thin layer of fats, it was a very juicy bite. 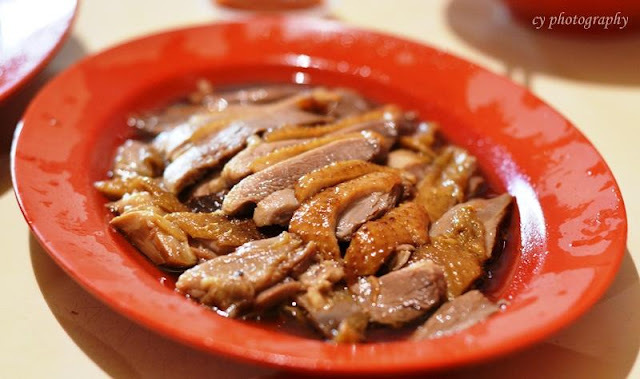 (+) The braised soy sauce, well absorbed by the duck meat, helped enrich the flavors. (-) The braised soy sauce complemented the kway chap well for the rice sheets was itself soaked in a bowl of soup rich with dark soy sauce but if consumed with rice, this sauce might not be thick and rice enough. (+) Soft and smooth rice sheets, well cooked. 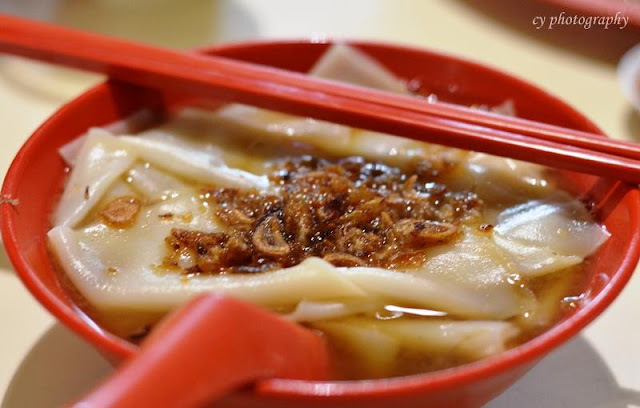 (+) Generous amount of fried onion slices, which garnished the plain kway chap. (+) The soup was relatively light with dark soy sauce which did not overpower the taste. (+) Was delicious on its own as a simple fare. (+) The pig's innards were clean, and the smell was not overly strong. (+) Braised meat was soft and had a good layer of fat. (+) Tau pok absorbed much of the braised sauce and was rich in flavors. Safest choice. 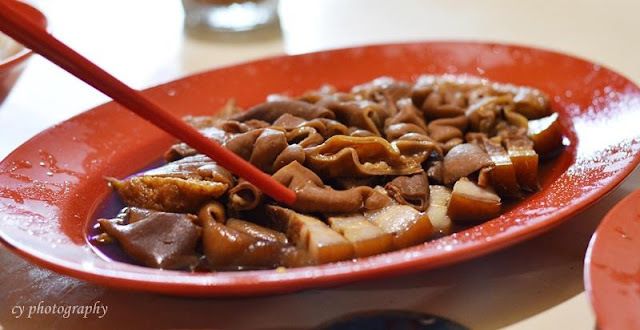 (+) Pig's intestine was chewy, rubbery and thin. (+) The pig's stomach actually tasted the best, about the same mouthfeel as intestine. (+) Pig's skin was the icing on the cake, tender soft, juicy fat and collagen boost! (+) As the stomach slice was thicker, it absorbed more of the braised sauce compared to the intestine so it was very rich in flavors and juices were being oozed out with each bite. (+) Braised eggs were cooked in braised sauce for a relatively long period in order to allow the sauce to permeate through to the egg whites to contain the rich flavors in. (-) Inevitably the smell of the pig's innards. (-) Braised meat could have been cooked for a longer period of time to get a richer flavor. Despite this stall being more of a back-up (as the Blanco Court stall was closed), I was impressed with the quality of food served. The wait time was about 10-15mins, though we breezed through that with chit-chat. Afterall Kenneth did order us a huge meal for breakfast! Oh well, I could not think of a better dish than 'hot oily kway chap' to counter the Monday morning blues and the cold wet weather.